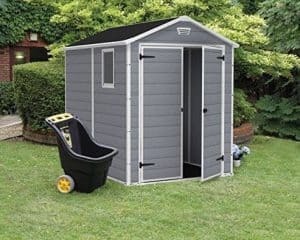 The Keter Manor Plastic Shed 8 X 6 is one very smart looking shed. This is a shed that has a very cool kind of style. It certainly does not look anything like a traditional shed and that is going to be what many people like about it. 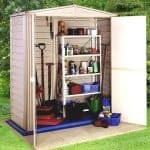 The shed is a decent size offering enough floor space for those of you who need somewhere to keep a few items safe, but do not have a huge garden for a large shed. The generous headroom make spending time in the shed a comfortable experience. This is aided by the small window to let in natural light and the air vents to let fresh air into the shed. The double doors do not just look great. They also make getting things in and out very easy. This is one very well made plastic shed. They have used polypropylene and made it have a wooden kind of look to it. These plastic panels are doubled up which makes them extra strong as well as taking away the need for a standard kind of frame. 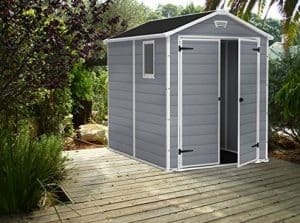 Also included with this shed is a floor which is strong enough to take the weight of any heavy tools, bikes or gardening equipment that you may have. The Keter Manor Plastic Shed 8 X 6 is a shed that really has impressed us. It is the kind of shed that captures your eye with its good looks, but then when you take a closer look, you realise just how well made this shed is. We love the style and feel it will look fantastic in any garden. Keter have done a great job in making sure it does not have a traditional type of shed look to it and we like that. The width of the shed is 6 feet 2 inches and the depth is 7 feet 8 inches which is a nice amount of room to have. They have also made sure the headroom is ideal as they claim that there is enough headroom in here to make it comfortable to walk around in and from just a glance at how high the peak on the roof is, you can see that there is plenty of headroom here. The apex roof they have used here is made with polypropylene like the rest of the shed is. We really like how they have made the roof have a slate kind of look to it. It certainly does look very high quality and as the panels are solid, you will have no issues with rain getting inside. We also like how the apex roof comes off at the sides so the rain will not run down where the doors are. 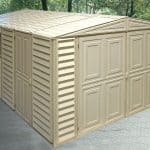 The Keter Manor Plastic Shed 8 X 6 is made with polypropylene which has been made to look like wood. We are sure you will invite a few friends round and they will want to go over and touch it as from a glance it really does look like wood. The walls are really thick, they actually say that these are double walls so they are very robust and strong. As this is made with plastic panels there is not really the need for a frame like you would find in a traditional shed. Instead the panels snap and slot together in a way that does away for the need for a frame. We actually like this as it means you can store items right up against the wall without a frame getting in the way. When we started this review we had a feeling that there would be no floor included with this shed. Well if we had put money on it, we would have lost as this shed does actually come with a floor. It is a high quality plastic floor which will keep your items safe from the ground and also be able to take a lot of weight. Including a floor with this plastic shed is fantastic and something we give them two big thumbs up for. One of the best things about plastic sheds is how you do not have to treat them. You install this and then that is it. You do not need to get the tub and the brush out, you can just get to work filling the shed up with all kinds of cool stuff. The only thing you may want to do is give it a clean once a year if it gets a bit dirty, but even that is something you do not have to do. This is a very low maintenance shed and we are sure that will be perfect for many of you. 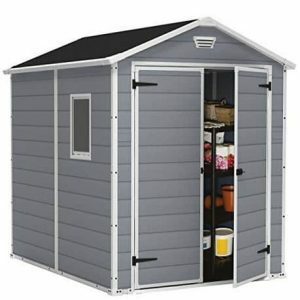 We would love to tell you what kind of warranty the Keter Manor Plastic Shed 8 X 6 has, but they do not have it listed! We have looked high, low and even called in Sherlock Holmes to have a look, but even he could not find it. 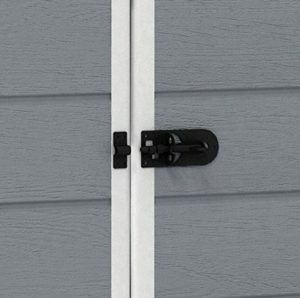 We would love to tell you that this has a ten year warranty like most other plastic sheds and our gut tells us it does, but you will have to make sure you ask before you buy. We really like the doors. Large double doors have been used and they are made from the same materials as the rest of the shed and done in the same style. This helps give the shed a very smart and structured look. The doors are finished off with this very appealing white trim that helps give the front of the shed a bit of personality. We also like the black hinges that Keter have used as they look great and are also very strong. 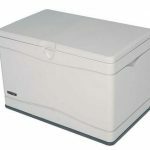 These are a good size too so if you have something large like some shelves or a mower that you are trying to get inside, with both doors open you will have no trouble at all. There is one small plastic window on the side. This is a fixed window, but it still is going to let in plenty of natural light. As well as the window there is a set of air vents on the top of the shed which will help with airflow in the shed. The Keter Manor Plastic Shed 8 X 6 has a pad bolt to keep the doors closed. 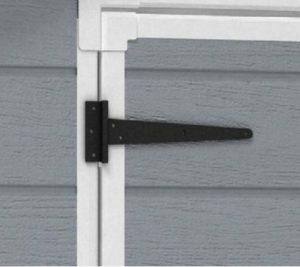 We feel that even in the worst wind, this pad bolt will keep the doors securely closed. If you want to lock the shed though, you will have to purchase a padlock which is cheap and easy enough to do. While there is a window on one side this is still a fairly private shed. You can easily position it so that it is not facing the street or any nosey neighbours. The window is not that large either so it is not as if it makes it easy for a person to look inside and see what kind of awesome tools and gardening equipment you have. 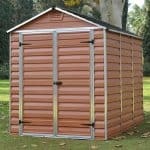 As is the case with most other plastic sheds there is no way to customise the Keter Manor Plastic Shed 8 X 6. To be honest with you though, this is one great looking shed. It has its own style and personality and we feel that there is no customisation needed. Surprisingly there are no extras on offer here at all. That is not really a bad thing as it is sometimes nice to be able to buy something and then not have a load of other stuff thrown in your face that you might need. The only thing we would suggest you purchase is a padlock which you can get in a pound shop. This is a very well made plastic shed. We feel that in its construction they have not cut a single corner here. This is a shed that is going to give you many years of service. The kind of plastic they have used is strong and will not decay over time. By taking out the frame and offering a good amount of headroom, this is an 8 X 6 shed that offers just a little more space than other 8 X 6 sheds. This is a two person job, but it is not a DIY job that is going to drive you nuts. This should snap together pretty easily and you and your helper monkey will have it done in a few hours at most. 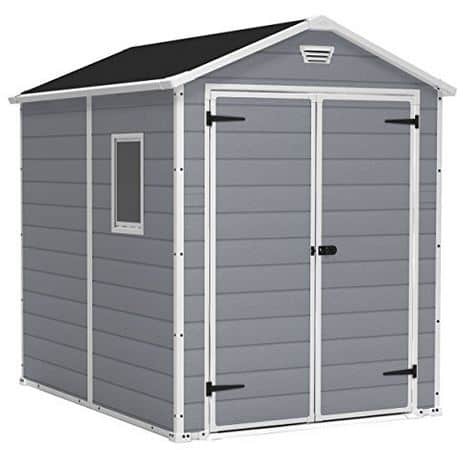 This is one of the more expensive 8 X 6 sheds we have seen, but at the same time it is also one of the best when it comes to the overall quality. 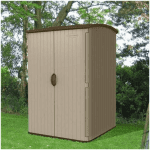 The Keter Manor Plastic Shed 8 X 6 is a shed that really has impressed us. As soon as we saw the first picture this was a shed that captured our attention. We just love the overall look of it and feel it is perfect for those who want a shed that does not look like a normal shed. The materials used are just so strong, long lasting and low maintenance that it does allow us to be able to overlook the rather high price point. 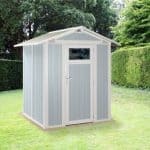 This is the kind of shed that you buy if you want to make sure the shed you are getting is one of the best, as they really have done a great job here.